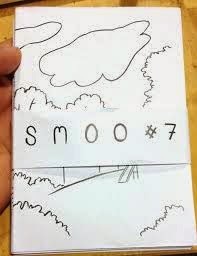 Simon Moreton's seventh issue of Smoo continues in his recent, ultra-minimalist style of drawing. Moreton's comics tend to be concerned with the act of walking and landscapes as a kind of mental clearinghouse. Abstracting that walk and the view on that walk down to a few essential lines is a way of digesting and making sense of one's thoughts above all else. In this issue, he returns to his childhood home and devoted three separate mini-volumes to three different views of a particular path taken. 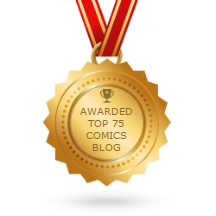 Of course, the comic is more than the walk and more than the view: it's the emotions that arise as a result of being in a particular place at a particular time. Moreton avoids the whiff of simple nostalgia or sentimentality while acknowledging the deep grooves growing up in a particular place leaves on a person. 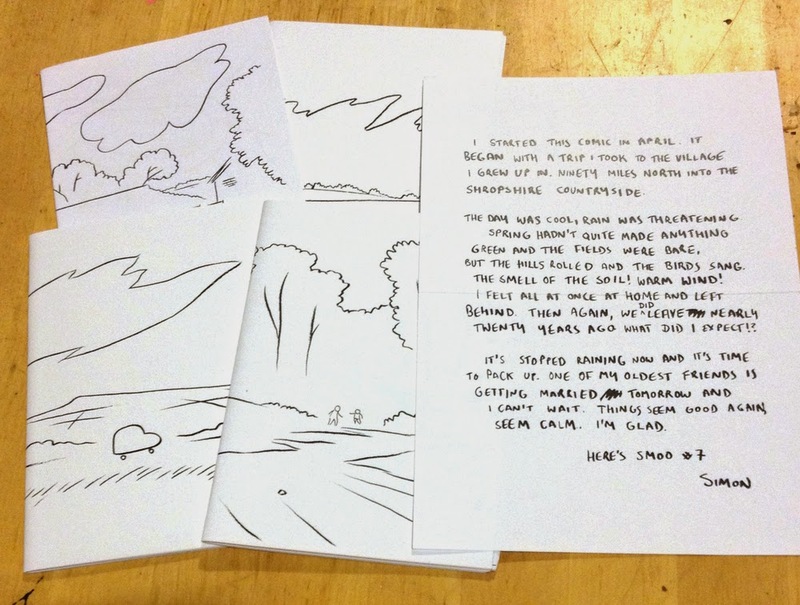 The mini actually begins with a letter from Moreton to the readers talking about the process of making the comic. He tries to get the reader to understand some of the more visceral conditions regarding the environment: cold giving way to sudden warmth, the threat of rain. That's followed by a map/poem, where a map of his home (labeled the way a kid might, with landmarks like "Old Pond" and "Our House") is intercut by text interact in clever ways, like a particular road labeled as "the road that takes you from here to there, forever" and a river labeled as "the Ledwyche flows through our woods...my heart in grassy patchwork". The map is really the closest Moreton gets to nostalgia, and he keeps it short. 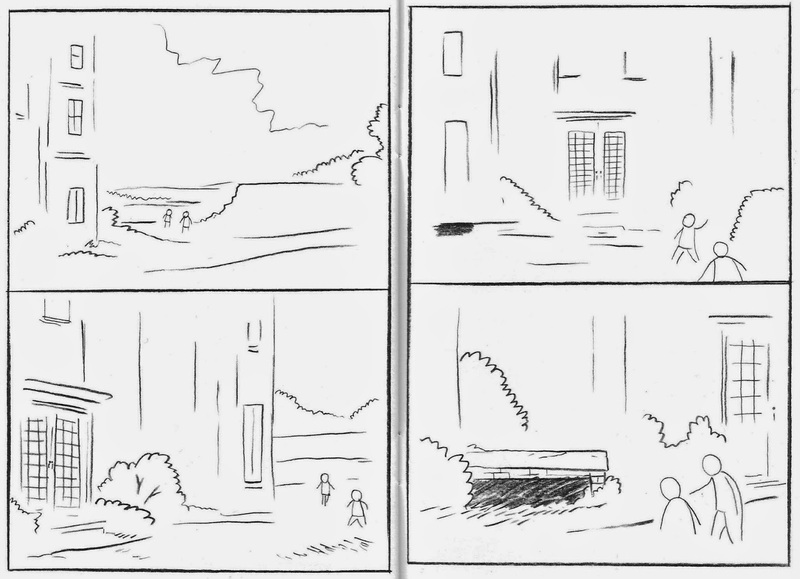 The next comic is a silent one; it details a walk in an old neighborhood. Moreton draws the sky and trees but is also interested in seeing how old landmarks have changed, drawing buildings for sale. His drawings are wonderfully minimalist; his own self-caricature is simply a round circle for a head and two slightly curving lines under the circle representing his body. He wants to represent himself as present in this walk, as part of the environment, even if he's just a small part of it. At the end, he comments on what's different about his neighborhood. The next comic begins with the phrase "This place is in my bones" as he recalls trying to run away once and then discusses his urge to want to run away. Moreton's battles with depression have always been a sub-theme of his comics, and this mini is the one that addresses it. The most compelling sequence comes when Moreton starts staring at the sky and clouds until his mind goes blank with several pages of no markings whatsoever. He confesses that he fights "the blues", but finds himself back in the same place emotionally, "the same sky" that he used to stare at in his darkest moments. 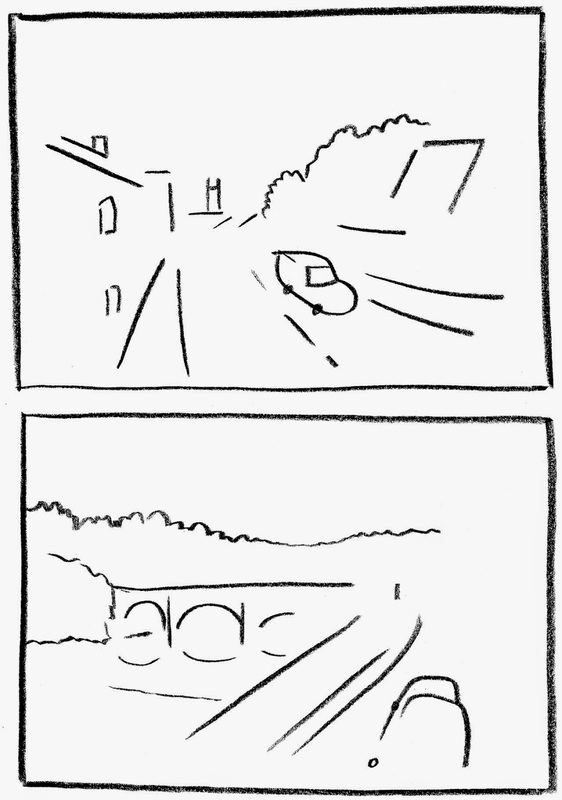 The final comic is about his memories of the old neighborhoods and haunts and the vague way they play in his mind; he notes "all my memories are myths" when he thinks of remembering a ball of light moving past him while walking down a hill. His memory of the woods is especially lovely, with drawings of far-off birds singing being replaced by simple, small and empty word balloons. The best feature was of "Caynham Court", an old, abandoned building that made for a myth-making playground for Moreton and his brother. Even with sketchy, abstracted drawings, Moreton gets at the sense of decay, the play of light and shadow, and features like a fake bookshelf that revealed a genuine secret passage. Revisiting these places now is less a matter of nostalgia than in thinking about one's own personal mythology and the ways in which it provided comfort as well as inculcate anxiety. I also wanted to mention a comic Moreton did for SPX 2013 with Warren Craghead, Twitching. It's a flip book, and Moreton's half is based on a picture that Craghead dew of a man standing outside using a camera with a telescopic lens. Moreton transformed that into a story of a man trying to get the perfect angle for a photo of a bird, only he can't quite capture it before it decides to fly away.The last panel/page, where the tiny figure of the man walks away from the camera in frustration while we see a wide swath of nature, is both funny and indicative of the difficulty of trying to frame nature. 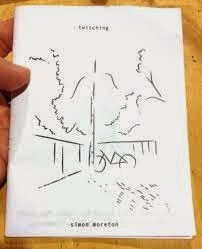 The Moreton-written "Blinking" is drawn by Craghead and uses a different approach: a thick and sometimes sloppy line, scribbles and other spontaneous imagery. It's all to depict the sensation of being bombarded by different kinds of light, and like the first story, we often see the point of view directly from the eyes of the narrators. Craghead's approach is visceral and immersive, while Moreton's approach aims at expressing the outlines of things as they are quickly observed. Both are beautiful in their own way.